Liliya Etkina (Long Island City) - Book Appointment Online! Newly renovated office, with brand-new equipment. 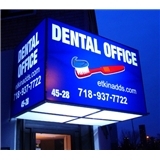 Dr. Etkina is a fabulous dentist ! There are many .many positive adjectives to describe her . Here is a list of just some of them . There are so many that I can't even list them all. 1. Skillful 2. Patient 3 .Thoughtful 4. Honest 5. Gentle 6. Efficient 7 Caring I could go on and on and on with positive adjectives describing her . Will continue going to see her and recommend her to my friends .